What could possibly be more useless than air-conditioned pants? Air-conditioned shoes of course. Unfortunately, that is just one of the many useless inventions you probably never knew existed. Continue reading to see them all. So here is another absolutely useless invention. 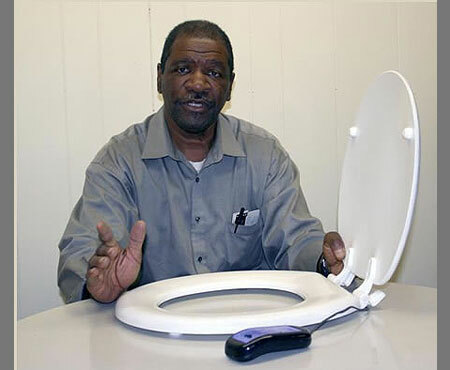 It’s the vibrating toilet seat made by Johnny Henry of Laurel, Mississippi. “This invention is designed to stimulate,” he told the Laurel Leader Call newspaper. “It’s to make you feel good while you are there.” Stimulate what? Laughter. 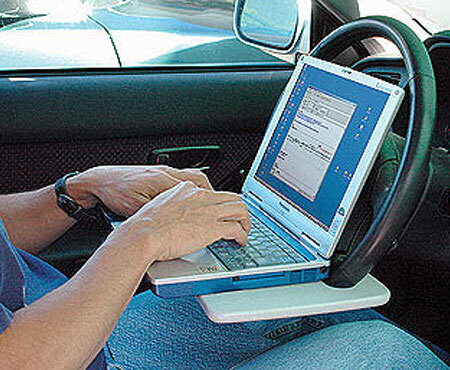 Attaches to your steering wheel for easy access to a writing and drink storage surface. The Go Office Wheel Mate Steering Wheel Desk is flat for writing and perfect for lunch or a snack. This Go Office Wheel Mate Steering Wheel Desk stores neatly in your car when used with the larger Auto Exec Laptop Car Desk. 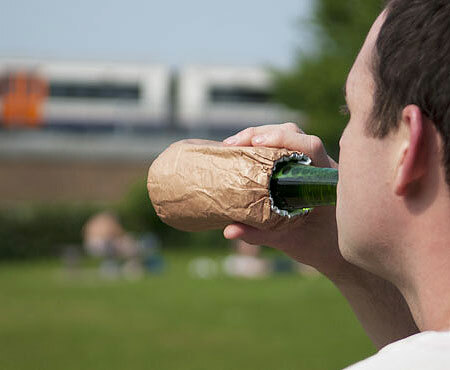 This reusable foil lined drinks cooler is designed to look and feel like a brown paper bag, but is actually made from water-resistant & tear-proof Tyvek. Just pop your chilled drink inside the Bum Bag to keep it cool for longer. 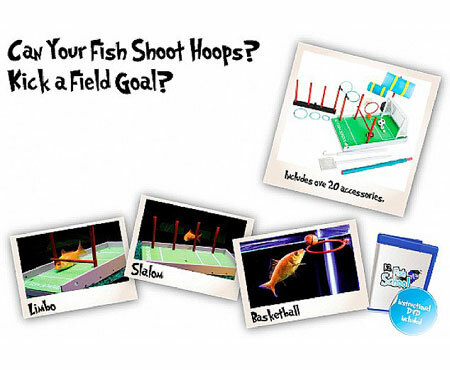 For the sad, lonely and eternally bored, at last here is a gadget to help you teach your goldfish to perform tricks. The trouble is you need friends to show off the tricks to and if you own this, you probably don’t have any. It’s a sad fact of life these days that we have too many TV remotes to keep track of. And who really has the space to keep more them all on the arm of a chair, or a table? 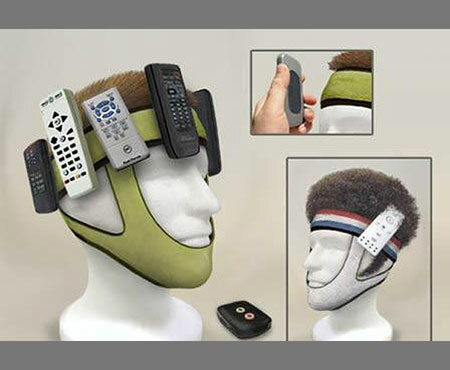 With Remote Headband, you can keep your living room de-cluttered and your remotes handily accessible – AND you’ll look cool doing it. 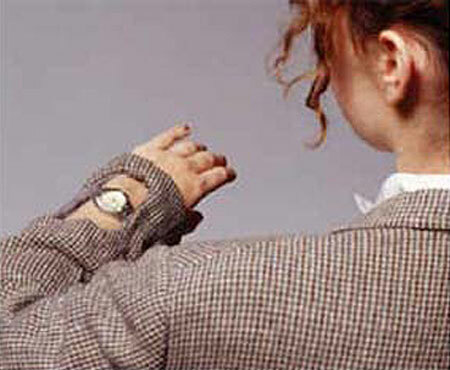 For those unfortunates among us who may have purchased a fancy new watch and have discovered that shirtsleeves cover it. Some ingenious entrepreneur has created this unusual jacket that is equipped with a see-through panel that allows the viewer to check the time without losing wrist warmth. 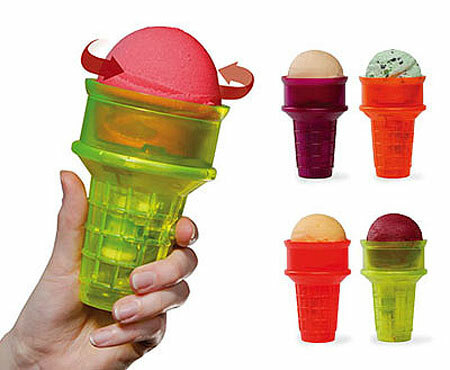 For those too idle to twist their wrist, just pop your cone inside this battery-operated turning cone and it will do all the work. You can even put it in the dishwasher, because washing up would be far too much trouble. Bloggers live and die by the keyboard, so you can imagine how many meals we eat in front of our glowing monitors. You may not know this, but your keyboard is probably the dirtiest part of your desk. 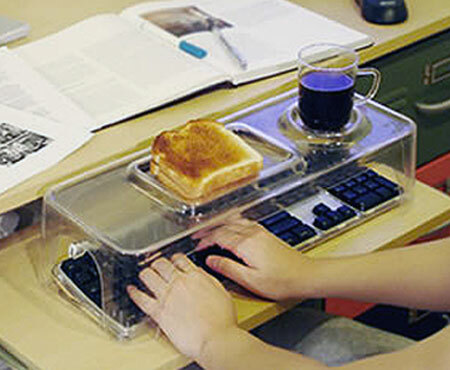 So instead of placing that turkey sandwich on that clacker, place it on the keyboard food tray. 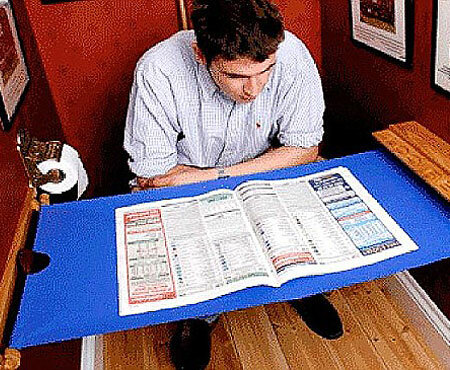 This ridiculous gadget is supposed to be ‘perfect for reading papers in the loo’. Available in broadsheet or tabloid versions, it seems you can also use it to ‘do puzzles or apply your make-up’. It ‘provides a platform for almost anything’. The Useless Box Kit arrives as most kits do: a pile of parts. With easy to follow instructions, you’ll be assembling your Useless Box Kit very quickly. Whip out your soldering iron, do a little bit of work, and then screw the thing together. When you’re done, you’ll have your own gleaming acrylic box. Set it on your desk and wait for curiosity to cause victim after victim to turn it on – each to be met with the little finger turning the box back off. The Useless Box Kit – the silliest science kit we’ve ever fallen in love with.